Since 1990, we’ve been providing homeowners with the best in spa installation and service. You can always count on getting honest, dependable workmanship and prices. Our exceptional customer service is what make our customers rely on us for all of their spa needs. 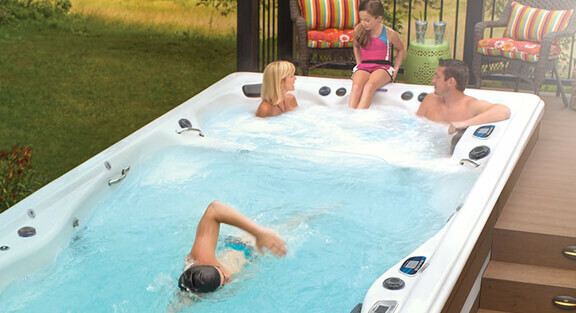 Swims & Sweeps takes pride in providing customers with only the best portable spas on the market today with models from Master Spas. You can see first-hand the wonderful models and options available when you stop by our showroom and take a test soak. Contact our spa experts today to discuss your needs and hear about everything we have to offer, or click here to learn more about the specific brands available at Swims & Sweeps. Swims & Sweeps offers the complete line of Michael Phelps Swim Spas by Master Spas. Deep shell design, LED lights and advanced jet technology combine to give you the ultimate swim spa experience. Come see us to discover for yourself the relaxation and fitness benefits of owning your very own swim spa.